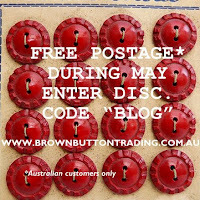 This new Aussie online store has free postage for Australian customers for the month of May. Visit her blog here for details. She sells stationery, ribbons, jewellery, Marvis toothpaste and other fine wares. I think i will buy the "Drinks Monitor" badge. And these glass canisters. Don't tell my mum. Daylight saving referendum - the outcome.